when i saw hitsugayaxhinamori doujins, i went crazy. so heres the first one. i really wanted to keep this simple. i even used photoshop brushes, and i really hate those. but i couldnt think of anything else that was simple like the brushes i used and so i kept it. i hope you like it! 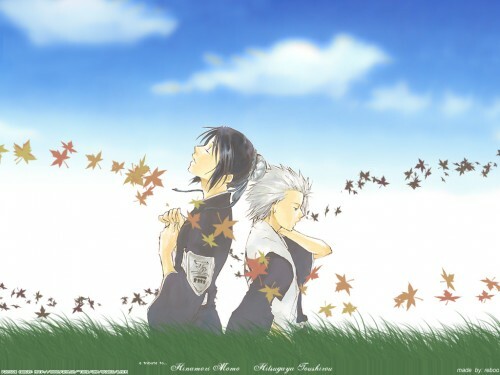 I love these two, but Hitsugaya is the best. great work and lovely coloring keep up the great work! well 1st of all the charas look like they would be growing rigth out from the ground. that's because of the grass there that btw looks strange on the botom. the clouds are too blury. and the part behind them is too white. Um.... your new work, right Reboo-san? Oh, i think this one is simple, clear and plain too ^_^ It would be better if you change the color of the grass differently so it will look more natural. And the leaf effect too +__+, look like it is the first time you are trying to use it ^_^ But that is okay, hope to see more work from you, sweetie! I always was a fan of this pairing! Its great to see a wall of them. Awesome job! I like what you did with the leaves~ Good job!